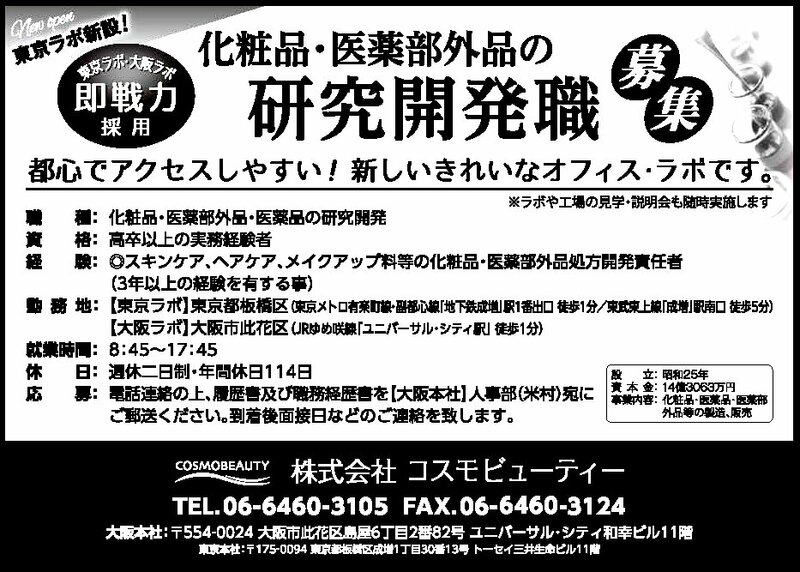 We will be exhibiting at Cosme Tech 2019 9th Int’l Cosmetics Development Expo (venue: Makuharai Messe). Received a patent for makeup base with high wrinkle masking effect. Received a patent for manufacturing of creamy facial cleanser. Completion of Nantong Factory inspection. Completion of the third factory in Vietnam. Added a 3 ton vacuum emulsification kiln to the Kanto Factory. Osaka Laboratory introduced an ultra-depth multi-angle observation system that combines the functions of SEM (electron microscope) and optical microscope. This allows the observation of the surface of hair, scrubs, charcoal, etc. clearer and more refines. Evaluation of hair care products, hair dye and raw materials can be done in more detail. 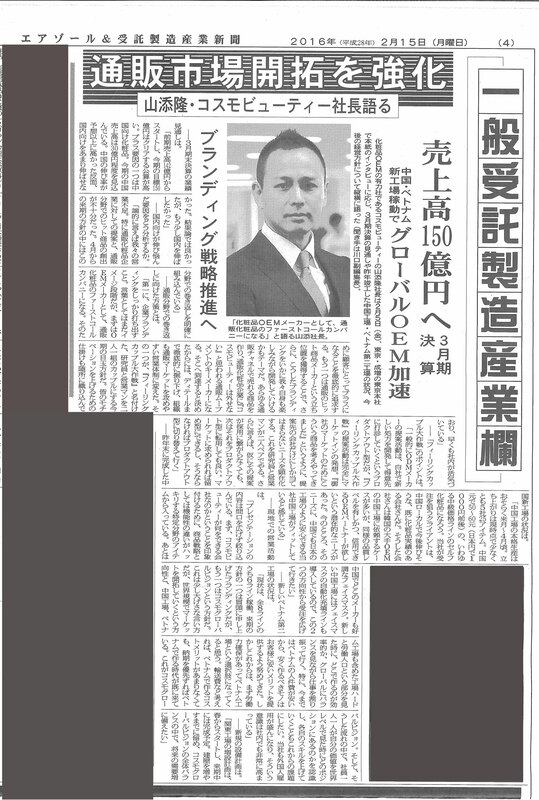 Article posted on “Aerosol & OEM Industrial Newspaper”. 33rd Fiscal Year Conference was held at Atami Korakuen Hotel on Saturday March 24, 2018. While the sales earning was expected to reach 20 billion yen, it was grandly held as a memorial event to reaffirm our future goal of 30 billion yen. We exhibited at Cosme Tech 2018 8th Int’l Cosmetics Development Expo (venue: Makuhari Messe). It was a great success with many visitors stopping by our booth! Thank you for all those who visited us. We developed next generation sunscreen material “ニルエイジ®” that blocks near infrared rays which damage collagen and elastin of the dermis layer. Int’l Cosmetics Development Expo on Friday Jan. 26th. The theme of the presentation is “Background and Future Developments that Created Hot Sellers Supported by the Customers” and “Current Situation of the Chinese Market Development”. We will be exhibiting at Cosme Tech 2018 8th Int’l Cosmetics Development Expo (venue: Makuhari Messe). The China Factory acquired all GMP (US, EU and ASEAN) certifications. The groundbreaking ceremony for the construction of the 3rd Vietnam Factory took place. We are currently exhibiting at the 22nd China Beauty Expo (Shanghai CBE) from May 23rd~May 25th. Exhibited at Beautyworld Middle East from May 14 to May 16, 2017. An article about the China Factory published on China Beauty Expo website. The China Factory acquired ISO 22716 (GMP) certificate for cosmetic manufacturing/quality control. All Cosmo Beauty Group factories are now GMP certified for cosmetic manufacturing and we aim to further improve the quality of our products. Exhibited at China Import and Export Fair.Thank you for visiting our booth! In September 2016, we expanded the first factory and extended the roof of the shipping site of the Kanto Factory. Osaka, Kanto, and Vietnam Factories obtained ISO 22716 (GMP) for manufacturing and quality control management of cosmetic products. 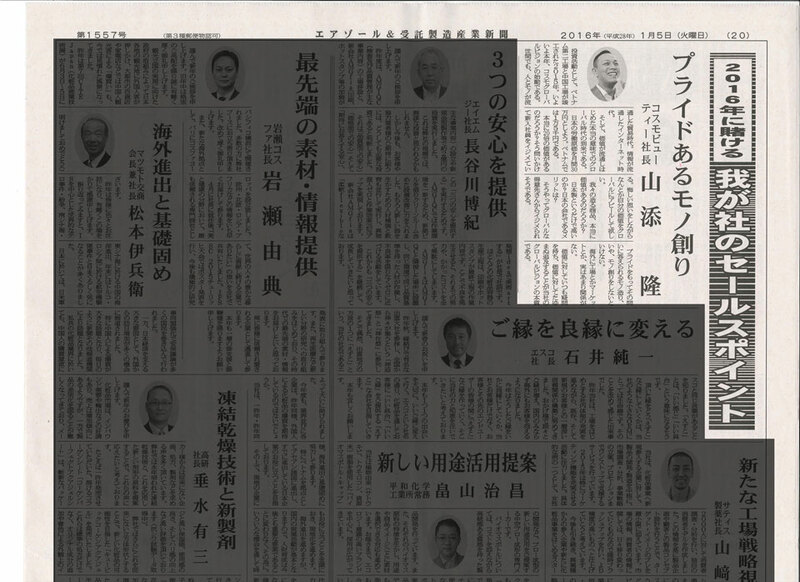 A video of our company was featured on “BEAT~Beat of the Times” on Yomiuri TV. Exhibited at China Beauty Expo from May 18 to May 20, 2016 in Shanghai. New factory in Vietnam completed. 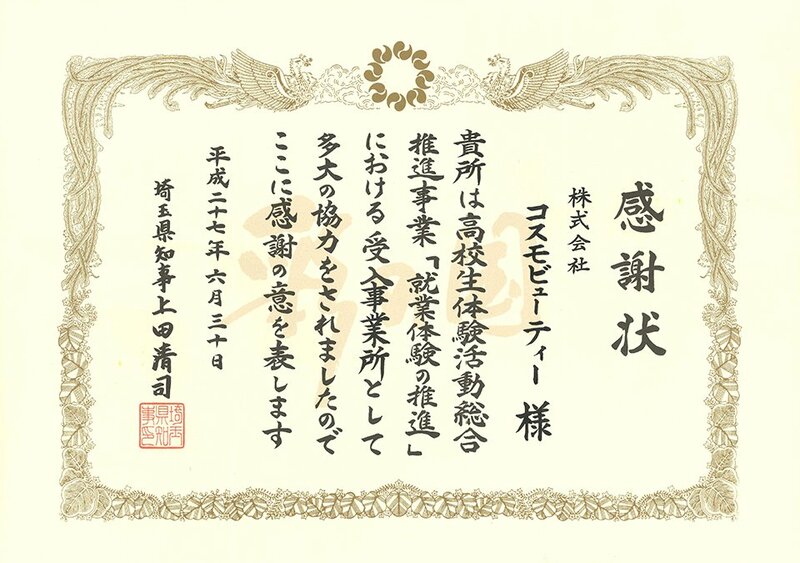 Received a certification of gratitude from Saitama Prefecture for “Experience-based Business Learning Promotion for High School Students”. Advertised in “Fragrance Journal October Edition”. New factory in Nantong Jiangsu, China completed. Tokyo Head Office relocated from Ikebukuro to Narimasu. Exhibited at Comoprof Las Vegas. Article uploaded on “Bplatz” website. Rebranding of our Corporate Philosophy. 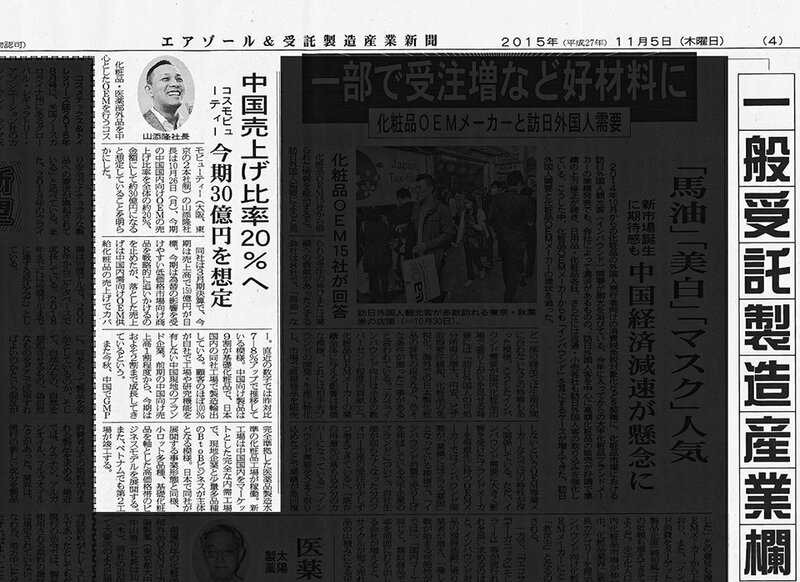 Takashi Yamazoe became Representative Director (CEO). 11F UNIVERSAL CITY Wakou Bldg. 6-2-82 Shimaya Konohama-ku Osaka-shi Osaka.